Thank you very much to all 13 participants of the 2016 summer school! The Statistical Cybermetrics Research Group at the University of Wolverhampton held a 1 and 2 day summer school on the use of alternative web indicators for research evaluations. Day 1: Theory. This will introduce the new theoretical model of alternative indicators and describe methods to evaluate indicators. Attendees have the option to submit a short abstract to give a short presentation on their own relevant work, if accepted. Day 1 is mainly aimed at active researchers (University of Wolverhampton, room MC225, 10am-5pm). 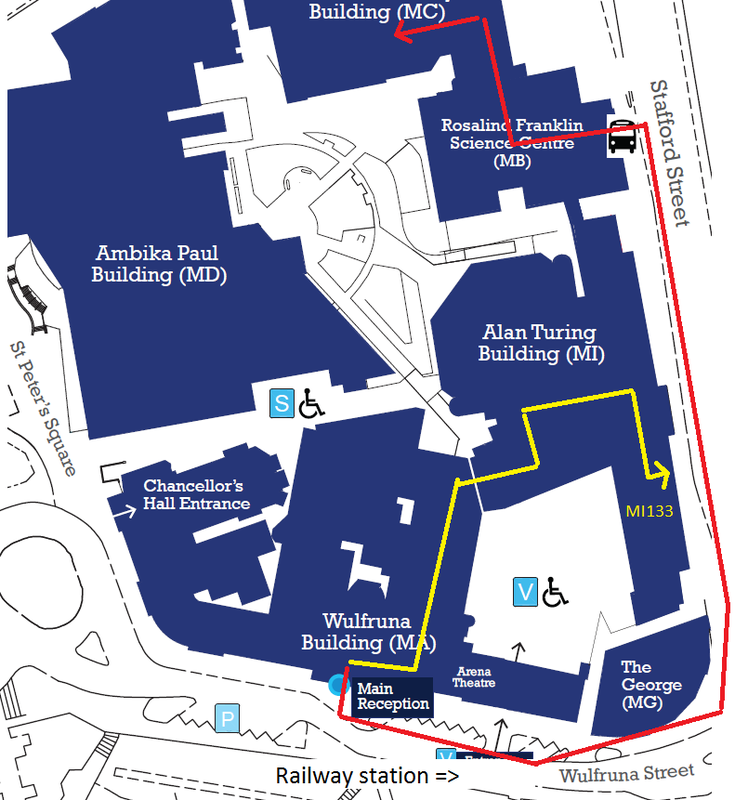 To get to MC225, go to the main entrance of the university (MA) to get a visitor card, need to register as a visitor at the main entrance, then walk down Wulfruna Street to the mini- roundabout, turn left and walk most of the way to the traffic lights, then enter Rosalind Franklin building on your left. Inside the building, turn right and walk through the coffee place, then turn left into MC building and use the stairs/lift to get to the second floor. The room is on the second floor of MC building (the red line in the map above). 4.30-4.50: Scholar Mirrors: collecting and analysing Author Level Metrics from the academic Web - Alberto Martín-Martín, EC3 Research Group, University of Granada, Spain. Summer School Curry: Thursday 8 September 6.30pm: New Spice 35-37 School Street, Wolverhampton WV1 4LF or meet at 6.15pm at the main (MA) entrance of the University to walk over. Day 2: Practice. This will start with an overview of a range of alternative indicators and will then introduce Webometric Analyst, a free software suite that gathers data for many alternative indicators and calculates advanced indicators for them. This will be followed by practical workshop sessions during which attendees will use the software to gather alternative indicator data and calculate and benchmark indicator values. This course will demonstrate how to gather and calculate indicators (benchmarked in the sense of field and year normalised) using free web-based data for commercial impact (patents), educational impact (syllabus mentions, PowerPoint mentions), informational impact (Wikipedia citations) and grey literature impact. Attendees can bring their own data in order to calculate a range of web indicators for it on the day (University of Wolverhampton, room MI133, 10am-5pm). To get to MI133, go to the main entrance of the university (MA) and follow the signs to MI. The room is on the first floor of MI building (the yellow line in the map above). Dates: September 8 and 9, 2016. Location: University of Wolverhampton, in Wolverhampton city centre. Course lecturers: Mike Thelwall and Kayvan Kousha of the Statistical Cybermetrics Research Group at the University of Wolverhampton. Application: Please email Mike Thelwall m dot thelwall at wlv.ac.uk with your name, affiliation, and reason for attending (1 sentence). Include a title and 200 word abstract if you would like to make a brief presentation on day 1. Accommodation: The cheapest option is probably the Redwings Lodge Hotel just round the corner (possibly a bit noisy though). Alternatively there is the Premier Inn by the train station. For student accommodation people please contact AccommodationServices@wlv.ac.uk individually to book places but these can be quite expensive compared to the hotels and are only worth trying if you are staying for a bit longer. Things to do in Wolverhampton and near Wolverhampton. There is also an unusual pub in Wolverhampton. The ess 2016 scientometrics workshop in Granada overlaps 4-10 September. (my [Mike's] fault for not noticing the clash, sorry). The STI2016 S&T indicator development conference in Valencia is the following week, 14-16 September. The 3AM altmetrics conference in Bucharest is at the end of the month, 28-29 September.